High rep training gets a bad name. People seem to think that anything over 20 reps is worthless for gaining size or strength and is nothing more than conditioning work or something women do to get “toned.” I have seen an abstract from a research study floating around the internet that argues that low-load high volume training stimulates protein synthesis to a greater degree than high-load low volume training. I only read the abstract so I do not feel I can really comment of this particular study in any meaningful way, but I was amused by people’s reactions. Without even reading the details, people just started going off about how high rep training has no ostensible value. Now, I am certainly not going to say that high rep, low-load training is superior to heavy weights, because I do not believe that. In fact, I would go so far as to say that when muscle growth or strength is the goal, heavy weights are really the key factor of any program. If you look at most successful lifters, you will see people of all sizes, shapes, and genetic makeups, and most of these people will train using different styles. The common denominator, however, is heavy weights. So in this sense, I can see why people would say that high-load training is superior to low-load training. If we have to choose one or the other, I would agree. Thankfully, however, we are not forced to choose one or the other. I actually think low-load high-rep training CAN have tremendous benefits. I emphasize “can” here because it really depends on how we employ it. If we are talking about the high-rep style you see in many commercial gyms, whereby people will endlessly curl the pink dumbbells while talking on their cell phones or to their friends, then yes, this is worthless. However, when used correctly and sparingly, high rep training can pay huge dividends. For high rep training to be effective, it has to be intense: heavier than normal weights, maximal effort. This is NOT pump training. If you think high rep training is easy, then you are doing it wrong. These are sets that have you questioning your own sanity half way through. If done properly, this style of training can trigger huge amounts of growth. I have heard of Tom Platz squatting 225 for 10 minutes or something crazy like that, and doing things like 315×50. The actually numbers here may be inflated, but looking at his legs, there is certainly a lot to be gained from high rep training. 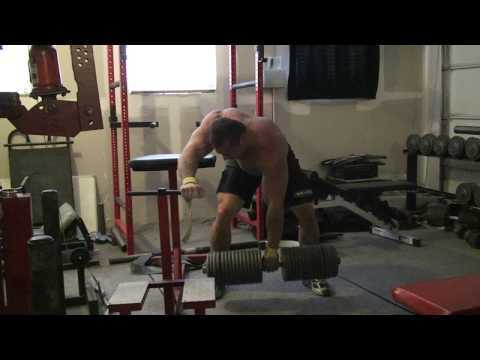 Likewise, Matt Kroczaleski has become famous for Kroc rows, which are essentially heavy, high-rep dumbbell to failure. Of course, he does them with 250 lbs in each hand. Looking at his back, I don’t think anyone would question their efficacy. For me, however, the benefits of high-rep training are more mental than physical. I have never used high reps on a consistent basis. Rather, I have used it sporadically as a mental test to spice up my workouts and push my limits. I have tried it on things like dumbbell “Kroc” rows, leg presses, hack squats, deadlifts, and squats, and have gone for anywhere from 20-100 reps. These are not fast, easy reps. I have gone until I literally could not go any further—true muscular failure. Let it be known that there is a big difference between muscular failure and mental failure. Most people fail mentally far before their bodies give out. High rep training will show you this discrepancy. Once you reach that point where you THINK you can’t go any further, you eek out 10 more reps and prove you can handle more than you originally thought. This lesson should not be taken lightly. Here is an example of some “Kroc” days that I did earlier this summer. Normally, I would NOT recommend this technique or pushing this hard, as going to absolute can negatively effect strength gains in the long term since the next few workouts will usually be comprised. I have learned a lot from reading Jason Ferrugia, who suggests that “death march” sets to failure are the kiss of doom. This is why I recommend using this technique sparingly, and perhaps before a planned off week or planned break so you can sufficiently recover. Despite what I just said, there is something to be said for finding out what you are made of. I liked to use these techniques on days when I was either feeling particularly strong and thought I could handle some good numbers, or days when I was just sick of the normal routine and needed a jumpstart. A brutal set of high reps to failure will give you that jumpstart, I promise you that. You learn a lot about yourself when you are placed in those situations. Will you quit, or will you keep going? The primary benefit to me from the high rep training is that learning your true capability translates very well when you return to your standard program in normal rep ranges. Why? After performing an all out set of 25 reps of heavy weight on deadlifts, that 6 rep set that you used to think was impossible just doesn’t seem that bad anymore. I have found that my low rep numbers go up a good deal after some high rep training. I do not attribute this to strength gains but rather learning how to struggle and push through the barriers of pain that will inevitably come when you push yourself (I am not talking about injury here, let me be clear). This is essential for lifters because anyone that is successful needs to learn how to buckle down and get it done. I see so many people with great programs on paper that get no results because they just don’t push themselves. Effort is taken for granted, but it shouldn’t be. It seems obvious, but a program is only as good as what you put into it. Truth be told, I spent about 2 years training with no clear goals to speak of but I still made quite substantial progress just because every time I set foot in the gym I left it all on the floor. I see some people that consult the top experts and do nothing but spin their wheels because they aren’t willing to get down and dirty. High reps can be a means to teach true effort. I have actually not used this technique for quite some time. It is not that I do not believe in it anymore, but at this time in my life, it is not in line with my goals. For one, I have no desire to get bigger at this stage, and these sets are definitely conducive to growth. Furthermore, I have developed the requisite intensity that I need to perform how I want, so it not as important to me at this point. Truth be told, my problem tends to be overworking myself, so I am trying to learn to throttle back a bit. These sets will make you very sore, so they are not something to take lightly. I can’t afford to be crippled with soreness right now since I am starting a new job where I am on my feet all day. If your goals are to gain muscular size and/or develop a newfound level of intensity, I think it has a lot of merit. Why am I recommending something that I don’t do myself? Well, I have done it plenty of times, and I am not saying it is for everyone. One thing you will learn about me is that I really dislike absolutes and the “one-size-fits-all” mentality. What works for some people will not work for others, and what works for someone at a given time may not work at a different time, depending on goals, life circumstances, etc. One word of caution is that I think you should be experienced in the lift you are performing before you give this a try. This is not a technique for beginners. It can be very dangerous and form can breakdown easily. Moreover, I really do think that for high rep training to be effective, you have to be using heavier-than-average weights, meaning you need a build a strength base first before employing this method. Even for the advanced trainee, you may want to choose exercises that don’t put you in danger as much, like leg presses, belt squats, hack squats, or things of that nature. In fact, while I typically prefer free weights to machines, this is one situation where I think machines may actually be better, because you can push yourself extremely hard without worrying about rounding your back, or balancing. Remember, the goal of this exercise is to increase mental toughness. I have used this high rep technique with both squats and deadlifts, and while I feel it is very effective, I would be hesitant to recommend it to others because it is certainly dangerous. That is one those “do it at your own risk” sort of things. There is a balance between pushing yourself to the limit and being stupid. One will make will better and one will hurt you. You need to find that balance for yourself. Once you do, I think you will find your training will go to a new level. You will be cussing me out in the short term, but in time I think you will thank me.